Official Pin Supplier to the AABA. No matter your sport, organization, or business, we can provide you with beautiful custom designed enamel pins. TEAM and LEAGUE insurance…We have teamed with an industry leader in sports insurance so that we can provide the best coverage possible. All Sport Accommodations (ASA) is an alternative for Coaches, Team Managers, and parents when planning team travel and specializes in booking hotel accommodation and transportation for teams based on their unique requirements. Baseball The Magazine – A glossy, full color publication devoted to the sport of amateur baseball. Managers, join Nations baseball today and receive your free subscription. The Official Wood Bat Supplier to the AABA. High Quality wood baseball bats at great prices. Baseball Express, a complete line of baseball and sporting equipment. 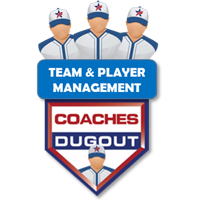 The USA Premier Sports is our official technology partner and is providing each team with a Coaches Dugout Team & Player Management tool along with a limited window to the Player Sign-up and other powerful widgets. Teams and players will receive additional visibility through being listed on the USA Premier Sports National website and College Coaches / MLB Scout subscriptions. We appreciate their assistance and sponsorship to making this a well run tournament with additional features for our Coaches and fans.